Hi, I recently moved into college and started up a 10g tank for a crawfish. Sal is an electric blue, around 2 inches, obtained from a nearby pet store, and he’s been in the tank around two weeks. About a week ago, his left eye started getting cloudy. If it was both then I’d be pretty sure he was molting, but there’s been no change anywhere else… And today I noticed the eye is getting more milky white and may even be getting larger? Is there something I can do? I don’t want anything bad to happen to him when he’s so new to the tank. What should I do for his eye? He’s getting a bit more reclusive now and I’m afraid he’s losing his vision in the eye. If you have any more questions you can reply to this email or call XXXX. Please leave a voicemail if I don’t answer. I'm having trouble looking up information about this. I now know more than I ever though I'd know (or thought I'd care to know) and have spent a bunch of money on a crayfish one of the cats dragged up from the pond as a 'gift'. It is all y'all's fault (won't embarrass myself on how many hours have been spent on your website) for having too much great information. So this little critter gets new digs, iodine supplements, fresh veggies and cocktail shrimp (sans sauce)? Guess I just ought to be happy it doesn't have to be spayed or neutered. Those darn cats. Your crew does a terrific job on educating folks and especially had to chuckle at the request for proper grammar vs. texting. Ah, if only I could figure out how to get the script font to work on this laptop. Thanks for the knowledge and keep your fingers crossed that I didn't fall asleep in class, otherwise I see another purchase in my future. for the knowledge and keep your fingers crossed that I didn't fall asleep in class, otherwise I see another purchase in my future. <That's a really kind email, and I'm pleased we've been able to help. 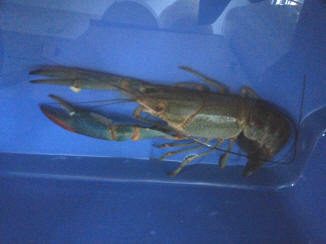 Hi my name is josh I got a blue Lobster a few days ago its around 8 inches or longer. Its not really taking an interest in eat as of now. I was told to feed him beef heart cubes and peas. I don't know if that's an accurate diet. Also today I noticed he's walking on his claws and front legs with his or her tail straight up. Is that a bad thing? I tried researching it a little and this site seemed to be the best. Please email me back at XXXX.com and let me know somethings about it. I attached a picture also so maybe you can help identify the species as well. Virtually all healthcare issues with crayfish come down to a prevention of trouble through proper care and the use of marine aquarium iodine. Once the crayfish is sick, there's not a lot you can do. Well the Cray fish died through an unfortunate series of events. It's the eggs that it was carrying I'm concerned for and it seems difficult to find information on how to take care of eggs without the mother. Any advice you could offer might help. Alright I certainly appreciate your advice. 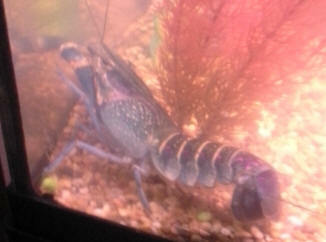 Our blue crayfish just molted today and lost one of his front claws. He's laying on the bottom of the tank upside down and moving very little. When I tried to roll him over he bolted under his rock but toppled over on his back again. Is he just exhausted from the molt or is it something more? 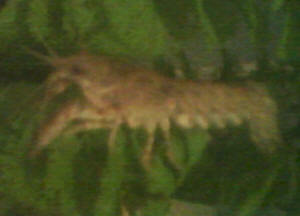 I have recently caught a crayfish, (my first one) and put it in a bug tank, filled with water, and stones. I put in a tube, also. I know nothing about crayfish ( except that the are delicious), and I have no clue how to care for it. My mother and father are divorced, and I can't take it back and forth. What should I feed it? Should I change its water? I put in some clams I found, and the Cray has not tried to eat it. I put in a fat river worm, if that will keep it alive. Please help! I don't want to eat my wild Cray, but keep it as a pet. I was playing gold <?> when I saw this bird eating something, and I chased it away and I found a crawfish with its tail eaten (gills still on body). I first put it back in water, but the bird came back for it so I ran home with the crawfish. It twitches from time to time, but you can't really tell if it's alive. It is in a bowl with room temperature, non filtered water. I called animal control. And they said Let nature take its natural course. I disagree. Can it survive, and if so, what should it et and what water temperature should it have? Please give me advice as Google has nothing and i have no idea how to raise one. 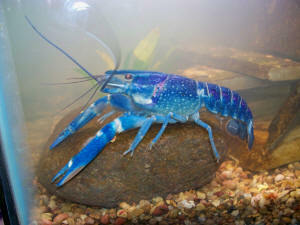 Hi there i own a blue crayfish and i have noticed that he or she is acting different its lying on its side a lot and scrating its under neath a lot im worried please help. 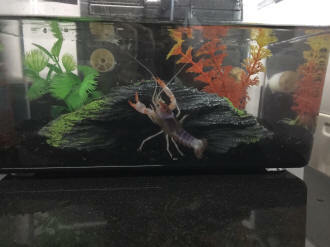 > We are new crayfish owners, only about 2 months. Our Cray has just gone through his second molt and it seems to not be going well. He finally emerged from his hiding place and there was shell everywhere. Immediately we noticed that both of his pincher arms were unbelievably long and all bent the wrong way. The poor thing is unable to move. He falls over and cannot right himself. He also will not eat. He also seems to have little white feathers coming out from where his tail meets his body. > After reading your web site I gathered that some iodine will probably help the situation. We have a 10 gallon tank a with waterfall filter. Will he shed these enormous appendages or will he eventually gain enough strength to move them? > I've attached a photo so you can see him. My daughter brought home a crayfish at the end of 3rd grade. The teacher was left with "Angry Bob", whom no one was willing to take as he was aggressive, so we took him too. Long Claw and Angry Bob did alright in a tub I kept them in. Knowing nothing about crayfish I just kept giving them clean water periodically and throwing spinach in. One night, about 2 months later, Angry Bob pulled Long Claw's one claw off, along with part of his belly. Thinking he was dead I was going to scoop him out. He swam away and I couldn't. The next night Angry Bob cut his tail off. I was pretty unhappy but kept taking care of Angry Bob. One day I thought he had developed a disease because his tail started looking real funny. A few days later the funny looking things become beautiful eggs, about 3+ months after Long Claw had died. As I scoured the Internet in complete confusion my daughter informed me that she knew Angry Bob was actually a girl. A little less confused, I watched a few weeks later as she trumped around her tub. I recognized this behavior. She was nesting. 3 days later I thought there were gnats in the water and wow, baby crayfish! She has taken great care of them, lugging around approximately 60 at one time under her tail. Having a new respect for "Angry Momma" I bought a reptile rock that she loves to hide in, much better than the flower pots, and crustacean pellets that sink. I know how hungry having kids makes you. 2 months later she looked very sick, laying on her side, and we had to leave town overnight. I came home and thought she was dead. Of course she had molted. Now, just one month later, she is acting the same way. I did just add a lot of water to the tub. Could she possibly molt again so soon? 1. How often can crayfish molt? Mine is red, by the way. 4. How often should I feed these suckers? 5. Is there a way to get them to grow faster? 6. How long can they live? 7. Is a tub horrible? Should Angry momma have a tank? We had goldfish that were a mess. I'm a single mom with 2 kids, a business, 2 toads, and a dog. I don't have a lot of time for maintenance and my kids can still only tend to simple things. Thank you very much for the info on your website and your help. I have a major problem with my female, Orion. She came to me with one claw smaller, obviously slowly regrowing. I noticed her carrying a bundle of eggs a few days ago (I'm not sure how fast the laying process is, I was very surprised to suddenly see "her" with eggs). Last night, my large male Boris was really restless and constantly trying to invade Orion's safety cave, even though his regular cave was empty along with two other caves. This morning I found Orion cowering in a corner, her regular claw ripped off, by Boris of course. I separated her from the other two large males, leaving only a two inch female, and a one incher, with a few fish to keep the balance. My concern is, with only a smaller regrowing claw, carrying eggs, and having a claw ripped off, will she survive this trauma along with her eggs?? I've been trying to feed her some greens, bloodworms, defrosted feeding fish, and brine shrimp, but i haven't seen her eating yet....so I'm very worried right now. Please tell me what I can do to make her as comfortable as possible and have her eating again! Thank you so much! PS: The two inch "female" Rorschach started carrying eggs about 10 days ago, but I noticed her reaching back and snacking on her own eggs as if they were M&M's, and currently she only has about 5 eggs left, but they are a strange light brown color. Is this why she ate them? Or the other way around? I should add, I was keeping the 2 inch female Rorschach, 3 inch female Orion, 4 inch Boris, and 4 inch Godfather all in a 10 gallon tank, along with a 3 inch Chinese algae eater male, Bobby, who stands up to the large male crayfish like a large black Spanish bull, also a 1.5" playful yoyo Botia, who strangely befriends everyone and takes turns sharing caves with the crayfish and Bobby, plus 6 zebra danios. Soooo yes, a bit too much for one tank, but everyone lived in peace. I keep the temp 65F - 75F, have a pump and bubble stones, lots of caves to go around, and do 50% water changes every week. I treat the water weekly with conditioner and Cycle, as well as aquarium salt. Water check hasn't been done in a few weeks, my bad. Iodine I just found out about reading through your website. I now have a 25 gallon beside the 10 gallon making sure there is no overcrowding. I use coral/gravel for the bottom, but do not have live plants. (I am also wondering if it is safe to buy potted indoor thick bamboo, let it root out in the gravel with some waste/food in the aquarium water, and then add it to my aquarium. I see thick bamboo in closed off small decor aquariums with small fish and African dwarf frogs, the waste keeping the bamboo alive, the bamboo adding necessary nutrients to the water, which keeps the water clean and the critters happy…strange. So back to the bamboo question...safe or not?) The aquarium diet consists of tropical flakes, chopped small fish, brine shrimp, bloodworms, frozen green peas, cucumber, and zucchini to keep everyone happy. Sinking pellets didn't work well since they dissolved too quickly and sunk into the gravel if my crayfish weren't hungry at the time, same with sinking crayfish pellets. I will do water tests, add iodine, sushi Nori asap, but for now my main concern is the wellbeing of Orion with her eggs, lack of appetite, left with only her small claw, suffering great trauma last night. Thank you so much! Thank you for all of the help Neale/crew, and the very quick response! I'm making major changes currently, and I guess I have to give Orion a few days to see if she starts eating, as obviously the stress has been great on her. The reason I kept all my crayfish together was because they were given to me by a friend who has had them in large communities, constantly reproducing for years in a 40 gallon cube tank, along with some tropical fish. <Ah yes, often happens. And it a big tank, you can get lucky. But crayfish aren't reliably sociable or peaceful, so I'd never recommend them as such. And of course LFS staff are not helpful at all. I heard everything from "peaceful community crayfish" to "two per 10 gallon tank can thrive for up to 20 years". When reading up on the Florida Blues, that was when I realized I will need a bigger/more tanks to house them all. They seem to have a wolf-pack system though. The largest male was the "Godfather" until the other male Boris took over the role after a battle, which thankfully only resulted in Boris losing an inch of his left antenna, and Godfather having a small piece clipped off of his right claw. I wonder if maybe I've been lucky so far which no cannibalism due to the conditions they lived in at my friend's 40 gallon aquarium holding about 40 Crays? As for the fish, I added them to the tank in a span of two weeks before the crayfish arrived, with Bobby, the aggressive Chinese Algae Eater protecting his territory, which seemed to work. He stands up for himself and for his new mate, another Chinese about the same size. He also is very protective of Nighthawk, the playful Yoyo Botia, scaring off any of the crayfish that wander too close to their caves. <I doubt he's actually protecting the loach. They may have common cause at the moment, but long term the chances aren't good they'll get along. I have had them in the 10 gallon with the Zebra Danios for about 6 weeks, only having one Zebra killed, and one injured. So, I think my tank has been installed with some Luck o' the Irish! But now I think I will be safer with 30 gallons for the 5 crayfish, two of which are still adolescent. If I have luck and have hatchlings, I already have a LFS who has a hard time shipping in Florida Electric Blue Crayfish, willing to buy all the surviving hatchlings once they are 3/4" in size. So, I am happy they will have a home to go to. So, I think I have taken the right steps and am now prepared to keep a safer environment for my tankmates. Last step will be the Iodine on my next stop to the LFS. On a final note, when cleaning the tanks, I do a full hand/arm sterilization as I was required in science/medical labs, and gently usher the Crays into my cupped hands to transfer them to the temporary bucket. They seem to be fine with this, and I am confident that with the thorough scrub down/wash of my arms and hands, I provide no potential harm or infection to them. <To be fair, the risk is mostly the other way. Aquaria are commonly infested with things like Salmonella wherever bits of food can decay in warm, moist areas. The only real risk going the other way is if your arms are soapy and that soap gets into the water as that can cause serious harm. Also, I feel that this is a safer transportation method then the net or the pinching in the middle, as this way there is no danger of a struggle ending up in an injury. Does this seem safe enough for the Crayfish? Once again thank you so much for the time and energy you and your staff put into helping out all these hobbyists, and I sincerely apologize for not doing enough research on my part, and for the many badly written and very brief emails and texts you and your crew receive. I can only imagine how irritating this must be on your part. Thank you very much Neale, for all your help and useful information, it is much appreciated! And I hope your weekend goes well, and you have a chance to sit back with friends and enjoy a cold one or two at a nice pub or at home! (we feed him shrimp pellets, veggies, algae wafers). Well, curiosity (and the fear that he had passed on) got the best of us tonight and we lifted the house to make sure he was okay. He's alive but he has not molted. There seems to be something wrong with his tail. Its red on the edges and looks as though bits of shell came off. Is this tail rot? How do we treat it? I checked everything in the tank. All levels are normal. Should I do a water change? Should we just let him be? Is there anything we can do to help alleviate his stress? Any suggestions would be greatly appreciated. We love him so much, we don't want him to be in pain or stressed. I have a lobster (Ornamental lobster might be the technical name) in my 55 gal. freshwater tank. The lobster is about 5 inches right now. I have owned him for right around 5-6 weeks, and he has grown substantially in size and molted at least 3 times in that 5 week period. First off, is it unusual for a lobster to molt that many times in that short of a time period? Second of all, when I got home from work today, I could tell that he had molted again due to his shell being more transparent than normal. Once he started to move, I saw that he had lost his two front claws and possibly a leg or two. I was wondering if this is maybe caused by his frequent molting? Also, I do have a red clawed crab in there with him, but I have never caught them fighting, but do realize it is a possibility that they might have had an incident while I was away. Is my lobster going to survive? Does he need his front claws to live? Also, if it is a known thing, how do I fix this possible molting problem? So off like a great parent, I proceed to the nearest pet store and purchase a fish tank. Being a novice and getting some bad advice my initial purchase resulted in all died fish, and the initial crayfish died before we had an opportunity to put it in the tank. Slightly more knowledgably, I proceed back to the fish store where they educated me of my mistakes and replace my dead fish. With my new found knowledge, we embarked on our next adventure and established the tank for a couple days, obtain new fish, caught a new crayfish from our stream and everything seem fine for about a week. Other than the amusing adventure of snippy and his great escaped, although I not sure my wife thought it was amusing. In any case, after a week, all the fish and snippy died. We are about to embark on our third adventure and my son really wants a crayfish, plus other fish in the tank. Before proceeding, we washed and emptied the tank, sanitized it and everything in it with Clorox, thoroughly rinsed it and let it completely dry for three days in the Sun. We just add water and the purification solution to prepare for our next adventure. With each miss step I learn more, but, cannot locate answers or advice necessary to make this third adventure a success. Is there a problem mixing a crayfish my son catches from a local stream with fish purchase from the store, which is how this adventure began? Is a 10 gallon tank enough? Am I better off with a purchased crayfish, and, if yes, is there a recommend species? We considered catching everything from the stream, fish and crayfish for the tank, would you recommend this adventure? Or is this another sad story in the making? What else should I be asking or need to know? I recently bought a pair of Crawfish under the impression that they were lobsters. I live in Pakistan. People running the aquarium shops know nothing about what they are keeping. I think they just catch fish and name them whatever they feel like and then sell them off to poor, unsuspecting people like me. Sadly, I decided to Google my new pets after getting them. I don't mind they are crawfish instead of lobsters. They look pretty. But I am extremely worried about how to care about them. I have been looking at different websites for some information, but I can't find any. Your site looks good so I decided to contact you. I hope you can help me. I will be very grateful. Here's the problem: I know crayfish are freshwater fish. I am keeping them in an aquarium filled with tap water. A few rocks, shells, etc. I'm putting Methylene Blue water conditioner 4-5 drops per week and Anti-chlorine instant formula 8-9 drops every time I clean the aquarium and put in fresh water. I have installed a filter in the aquarium as well. I put around 5 biscuit like tablets in the aquarium daily as the guy at the shop instructed. The Ingredients are: White fish meal, Wheat Flour, Spirulina, Scallop Meal, Wheat Germ, Yeast Powder, Seaweed, Red Alga, Chitin, Lactic acid Calcium, B-carotene, B-glucan, L-lysine, DL-Methionine, complex vitamins and minerals. Now the problem is I think something's wrong with my fish. One is blue, the other is red. The red one seems fine. The blue one seems reclusive. It keeps hiding behind a rock in the corner. <May be different species, one more/less territorial than the other. When I brought them in about a week ago, the blue one used to be active as well. Both of them used to swim around the aquarium. Now it just lies there in the corner. I'm afraid it's not even eating anymore. I can see the tablets just sitting there in the water. I don't know if the red one is eating or not but at least it still swims around a bit. I don't know what's wrong. I've been reading your Iodide FAQs and I'd love to read the source publications of where you get your information. Could you possibly email me a reference list so I can get into the nitty gritty of things? I'm specifically interested on how iodide aids the moult process. Thanks for your reply! Unfortunately, all searches u suggested turned up empty. Can you please sent me references for the advice you give??? <Iodine helps crayfish grow and moult successfully. You can use the iodine sold for marine aquaria. Dose at 50% the amount it says on the bottle, each time you do a water change. Alternatively, you can use JBL NanoVitol is a very economical product designed specifically for freshwater aquaria and can be used as directed on the packaging. It is possible to keep crayfish successfully without any supplements, but you will need to use iodine-rich foods on a regular basis, for example marine seaweed (Sushi Nori). Last week, on Thursday, my husband mentioned something about a tower by the porch. He, points to the ground by the back porch. There is a tower of Mud that stands about 10 in tall with a hole in the middle. He said, I'm watching to see what comes out. We figured a mole, or some kind of frog. Friday we had a hard rain, and it washed away some of the tower, so he is standing there watching to see what comes up. It started coming to the top to rebuild the tower. When he saw what it was he knock over the tower and put what came out in the fish tank (it didn't have any fish anyway). I know it is a Crawfish but not what kind. (I believe it is a male). We live in Eastern Alabama middle of the state 10 miles from the Chattahoochee River that separates GA and AL. We had a creek that went through our back yard, it finally went underground about 17 years ago. I have attached two pictures of it. About 7 years ago, we had been doing some digging in the back yard and came upon some old rusty barrels, they were full of water and it had a bunch of little ones in it, we caught 2 little ones and one big one (not as big as this one). But they only lived six months. I think the big one ate the little ones (along with the rest of my fish). The big one also kept escaping the tank. With this one, we have removed all the fake plants and moved the two fixtures that are left to the middle of the tank. And taped over all the openings. It has a filter and heater, with gravel on the bottom. I gave it a piece of cooked shrimp and put in flake food. It has not eaten the shrimp. I would like to know what kind it is and I have been reading your site for feeding tips. Won't lettuce float? And should I just cut up small pieces of carrots and zucchini? How much do you feed them? Thank you for letting me know what it is. I have read the basics already and I've been reading everything else on your site. I bought the Algae wafers and shrimp pellets for bottom feeders. I only found 1 store with the iodine and it was such a large bottle, I saw somewhere on your site that I should use, 1 drop for a 10 gallon tank a week. Does that sound right? Also, the girl at the store said I didn't need it, "we don't use it here". I have seen your thoughts on things like that. I also have read some of the comments and thought I trust your information more than hers. I will go back and get the big bottle. You mentioned its' small size, I thought it was pretty big. When it is still and straight out from the tips of his claws to the tip of his tail he is approximately 5 inches long. Does that mean he will get bigger? I took the solid house out and replaced it with a new longer fake log that had several openings in the sides and open at the bottom so it could dig out and get comfortable. I have see several listings of foods for them but not sure how much to feed, it also says to remove un-eaten food. But no suggestions on volume or duration to leave it there. Any suggestions for me? I don't want to under feed it or leave extra for too long. Thank you Neale! The information on what and how much to feed it wonderful. The algae tables are not as big as a penny and the seem to dissolve in about 5 minutes. Did I get the wrong thing? <Sounds like it. Use these for now; if the substrate is sandy rather than gravel, the crayfish will "sift" the sand and extract the nutrients. Smooth, non-calcareous sand, like pool sand, is ideal for crayfish tanks. The best algae wafers for crayfish are the sort sold for Plecs, for example, Hikari Tropical Algae Wafers. These take hours to fall apart. A German company called JBL also make a whole range of foods expressly formulated for freshwater crustaceans. Neale, it has gravel not sand. Where is the best place to get the sand? Do they have it at a pet shop? And I know I sound stupid but what is a "Pot" you mentioned to supplement the diet? for stupid questions. Have a great day. clams, live shrimp, squid...he seems to only like Krill or dead shrimp if I hand feed him). hours now), is he a threat to my 2 clowns or my puffer? I appreciate your advice and I apologize if I overlooked an article already addressing a similar situation. I know nothing about crawdaddies, crayfish, whatever people call them. But I do know that they like water, are mostly found in or near creeks, lakes, ponds, etc., So I found the behavior of the two crawdaddies that I found peculiar. I was out at the barn taking care of my horse when I started walking toward the barn door and there crawling toward me in the dirt was a very large Crawdaddy. I looked at him and thought to myself, "where the heck did you come from? ", well I went and found a bucket to put him in and put some water in it and the Crawdaddy. I went on getting hay and such for the horse and as I walked toward the barn door again there was another Crawdaddy in the aisle way. I thought at first that maybe the one had gotten out of the bucket so I checked. But no, this was another one. I put that one in the bucket with the first (cause I was taking them home to show my 7 year old son) and finished up what I was doing. I didn't see anymore so when I went outside the barn I looked all over the ground figuring I might see more but there was nothing. Ok, my question is, Is it normal for crawdaddies to be so far away from a main source of water? I mean there is a culvert where excess water comes through and runs through the pasture but it is a good ways over a slight hill from the barn and the crawdaddies would have had to come up through the field and around the corner to the front barn doors. Other then this water source there is now where else. It was raining that night and it had rained for the two day before too. I did look up crawdaddies online to learn a few things and I do know that I have one male and one female here. I don't know which I found first though. Could one have been following the other? Also while watching them I noticed they sit up on their pinchers a lot. Is there a reason they do this or is it just something they do? Also the female seems more aggressive then the male. I am guessing this is normal? I have read that they are great to watch in a tank and war are thinking of keeping them so I am trying to learn all I can about them. I just found it quit odd as to where I found them and wondered if you could shed some light on it for me. 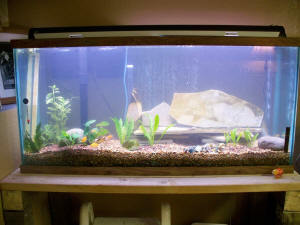 I found the following link to be broken while searching for information today: Forget Crawfish Pie, Let's Make a Crawfish Tank! I remain grateful for the hours the crew spends answering letters and doing site maintenance each day. Keep up the good work! My daughter's and I found a crayfish under our carport, walking around on gravel when we arrived home. There are no bodies of water near us, but I am sure that is what this is. I put him into a one gallon tank and covered him with water, but his movement is greatly declining and I am worried. It is the middle of the night and we have only one other fish (a beta) for which we have no pH altering chemicals or anything. I used distilled water that was just under room temperature. I have heard they are interesting creatures and think it would be great if my daughters could learn from this, but I don't want to kill it because I am keeping it. Could it simply be sleeping? Or should I just set it free on gravel as we found him and hope for the best? distances, but they dry out quickly, so do so at night during rainfall.>Also, why must this little creature be kept in a 10 gallon tank? <Well, for a start they grow! But really, the analogy is this: A German Shepherd dog would fit just fine in your garage. But would you keep it in there for life? Of course not. Just the same with fish and crayfish. Your Betta needs a 5 gallon or larger aquarium to have any sort of quality of life, and a smaller aquarium would not only be psychologically cruel, but also wouldn't dilute the wastes it produces fast enough. That's why I get a bit cross when people write in about their sick Bettas in 1 gallon bowls! At first arrival into the 1 gallon tank he climbed on and in the rock, as well as pushed around gravel for a very long time. He seemed to be ok with the amount of space he had is what I am trying to say. Any help you can give would be much appreciated! a Bob guy told me to try a bb? <Then you should research the fish yourself, not listen to some guy, especially on YouTube. I've seen videos of Blacktip Reef Sharks in 180 gallon aquariums on YouTube. Clearly, these folks aren't necessarily experts in the field. You can do research on WWM with any of the fish that you become interested in by using the Google search bar on our homepage. .... And I'm super Sorry I'm bothering you a lot <it's "a lot.".>. Really. Thank you.! <It's not that you're bothering me, because I'm here to answer questions, but a lot of the things you're asking me are already on the website, and we do ask folks to use the site prior to e-mailing us. Also, the spelling/capitalization/run-on sentence issues have begun to creep back in, so it takes me extra time to fix your e-mails in order to get them ready to go onto the site. Overall, these are things that you can research on your own, taking pleasure in the process of discovering and learning, and then e-mail if you have questions that you can't find the answers to, or if you read something you don't understand. I am a teacher and a few days ago one of my students brought in a crawdad as a classroom pet. I, of course, accepted but have no clue what all is entailed in the care of a crawdad and have been doing my best to keep him happy. As of right now, he is in a 10 gallon aquarium (I was told this was the size needed for a single crawdad), the water level is much higher than he is used to (about 6 inches), there is a cave he has to hide in, and an aerator. He was in a little carrier and, from what the student told me, had been living in about 2 inches of water, with some gravel, and kept in a dark corner. Since placing him in the bigger aquarium, he has been running back and forth like a jack rabbit, climbing on the cave, pushing it away from the walls of the aquarium, and seeming like he is trying to find the surface of the water. The other thing is he keeps attacking the aerator. This morning I came him to find he had moved the gavel to form a hill and he was swinging from the aerator (which had been previously out of his reach). In a nutshell, my question is, is this normal? Should I be worried? Also, is there anything else I need to do to care for my crawdad. Various websites I have been to have been fairly vague in terms of assistance. Even the information I'm getting from different Petco people changes from person to person. Shortly after I added several fish including some different types of tetras, a couple of bronze corydory's, a Plec (who is growing extremely fast), a male and female fighting fish and recently a couple of guppies. I was ecstatic since I did not know you could keep such a pet and had always wanted to keep a lobster as a pet (in freshwater anyway 'I later learned that it is not a true lobster but a crayfish from reading many sites devoted to this type of thing). Anyway, he lives in a 10 gallon tank with 1 beta (which he has attacked the other night), 4 ghost catfish, 1 bright yellow cichlid (which is separated off since he attacked the beta before the arrival of the "lobster"), 2 mollies, and 2 guppies (was three but he ate one of these before I noticed he was in there).